A decorated Vietnam combat veteran. Founder of the Veterans Suicide Prevention Channel. Glenn served in the Vietnam war as a Quartermaster aboard the USS Rupertus, Destroyer DD851 from 1971 to1972. During his service his ship engaged land based enemy artillery units in battle while serving on the gun line in the Gulf of Tonkin. Their actions served to draw enemy fire away from American land based infantry units in Khe Sanh and Quang Tri. It was during one of these shooting missions in the Gulf of Tonkin that Glenn was injured and eventually medically evacuated back to the United States to the Oakland, Naval hospital. Glenn received an honorable discharge from the United States Navy and was released from Treasure Island, San Francisco in 1972 and is currently a 100 percent Service Connected veteran of the United States military. For his combat service, Glenn, along with other members of the crew of his ship received 2 Combat Action Ribbons and a Special Citation from the Secretary of the NAVY for bravery and gallantry under fire. Currently a resident of Round Rock Texas, Glenn has created and founded the Veterans Suicide Prevention Channel (VSPChannel), America’s first national broadcast channel for veterans and their family members. The channel is currently slated to become the “VSPChannel Wellness Network For Veterans and their Family Members”. Currently an internet channel, the Veterans Suicide Prevention Channel can be accessed nationwide online at www.vspchannel.com. The channel is also available on the Department of Veterans Affairs secure online system as of January 5th, 2016. This VSPChannel is designed to broadcast shows that promote wellness to veterans who suffer with PTSD, anxiety and emotional/mental illnesses as well as physical ailments created by their military service for America and after service as well. The VSPChannel now plays content 24 hours a day, 7 days a week that can be accessed in the privacy of veterans homes. Glenn had a long career as a stage actor after leaving the NAVY. Acting was one of the few things that his PTSD would allow him to do although it would be years before he understood that he suffered with that condition. During the time that Glenn was in the military, PTSD had not been discovered and depression as well as anxiety were seldom diagnosed. They labeled these conditions “Battle Fatigue” or “Shell Shock” and there were no treatments for it in those days. The only thing they did for Glenn at that time was give them large amounts of Valium and other sedative type drugs. In 1993, Glenn enrolled in film school to earn a Bachelors of Art degree in cinema because of his desire to continue a career in the arts. He wanted to become a film and television director/producer. He was accepted to attend at the prestigious Los Angeles Film School, Columbia College Hollywood where he majored in cinema and minored in television production. a Golden Empixx for his feature length undergraduate project “Frequency” and a PIXIE Award for his music video “Obama-Time Rap”. Glenn became a single parent shortly after graduating from Columbia College Hollywood. He had to take on regular employment to make ends meet to support himself and his young son Keith. He began working as a Youth Counselor in South Central Los Angeles working primarily with young gang members, at risk youth in a clinical setting at the Community Youth Sports and Art Foundation in South Central los Angeles. A few years later Glenn re-married. His responsibilities as a parent and now a husband seriously limited what he could do as a filmmaker for many years. It reduced his love for production into a hobby. Glenn spent several years working in a mental health facility for children as a Residential Counselor until he once again succumbed to his PTSD condition. In 2013, Glenn, now retired, moved from Los Angeles to Round Rock, Texas. 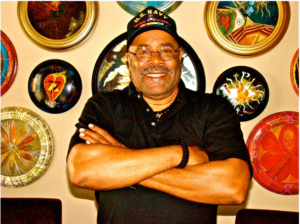 He began painting clocks in 2010 after his wife Juanita, a published artist, was diagnosed with breast cancer. After moving, the VA in Los Angeles submitted a Mosaic Art Seal that he had designed and created as part of a Group Project with his PTSD group at the Downtown veterans medical center. They called him in Texas to tell him that he and the group had won a national gold medal by the National Veterans Creative Arts Festival, which is sponsored by the Department of Veterans Affairs and which was held in Milwaukee, Wisconsin in 2014. Glenn and his wife Juanita were flown there, all expenses paid and they had a great time. A few week later three of Glenn’s hand-painted art clocks were exhibited at the “Institute of Texan Cultures” (a Smithsonian Institute affiliated museum,) located in San Antonio, Texas. The exhibition was as part of the state of Texas’s VSA organizations “Distinguished Artist Veterans of the state of Texas Exhibit”. Thirty veteran artists were selected for that exhibit. In 2015 two of Glenn’s hand-painted clocks were selected to exhibit with 15 other veteran artists at the “Art Center of Corpus Christi” and in 2016, his “Soul Singer Trilogy” was exhibited at the Terazzas Library, in Austin, Texas. It was 2014 that Glenn First got the idea to create the Veterans Suicide Prevention Channel (VSPChannel) after hearing a television report that 22 veterans a day were committing suicide. Since that time the past DOD Texas State Coordinator Murphy Roland presented Glenn and his organization the “MOST INNOVATIVE VETERANS SERVICE ORGANIZATION IN TEXAS AWARD, 2015”. The Texas Association of Nonprofit Organizations made the VSPChannel their SPOTLIGHT organization in 2015, and Stars & Stripes Magazine wrote a featured article about Glenn and the VSPChannel in 2016. On January 6, 2016 the VSPChannel sponsored a “Breakfast Summit To Prevent Veteran and Military Suicide” which was held at Camp Mabry, near Austin, Texas. The event was well attended by Texas State department officials, Veterans Service Organizations and military leaders of Camp Mabry. It was during this summit that Glenn Towery got the idea to create Veterans Suicide Prevention Officers for VSO’s such as VFW, American Legion and the DAV. Glenn Towery was appointed the Department of Texas, Suicide Prevention Officer for the DAV, the first ever in the history of that organization by incoming State Commander Charles Edwards. Unfortunately and for no given reasons, that appointment was rescinded a few weeks later. Glenn Towery continued his work with the Suicide Prevention Officer that he created and the Military Order Of The Purple Heart partially adopted the program into their organization and appointed Charles Eggleston as its National Officer. NABVETS also recently voted to adopt this program into their organization in 2016. This year the Veterans Suicide Prevention Channel is transitioning into the VSPChannel “Veterans Wellness Network”. We are presently creating a national campaign to raise funds to build a multimillion dollar broadcast and production facility in the state of Texas near Austin.